The stuff was very nice with us and they even let us deposit our luggages in the last day so we could visit the city. We had even a small kitchen where we could prepare ourselves some food. There was air conditioning and a balcony for every room. Good location,clean,spacious rooms,very friendly staffs. Nice and comfy rooms supplied with the necessary equipment and facilities. Great views from top floors l and quiet ; pleasant location - a well run establishment. Quiet relaxing and peaceful traditional island. Everything in easy walking distance. Thermal baths and safe swimming. Accommodation excellent. Nice and quiet, clean pool, friendly and helpful staff, a mini market in the hotel, a furnished balcony in the room. Panorama Hotel Apartments This rating is a reflection of how the property compares to the industry standard when it comes to price, facilities and services available. It's based on a self-evaluation by the property. Use this rating to help choose your stay! Located 0.9 mi away from the center of Rhodes Town, Panorama Hotel Apartments offers self-catering accommodations with views over the complex’s swimming pool. It includes a restaurant with International cuisine and a poolside bar. Diagoras International Airport is 8.1 mi away. The lively town of Faliraki with its great variety of nightlife options is a 20-minute drive away. Free public parking is possible on site. When would you like to stay at Panorama Hotel Apartments? Elegantly decorated studio with kitchenette, TV and private balcony overlooking the pool. Air conditioning, fan, and safety box are available upon surcharge. Featuring a kitchen, this elegantly decorated apartment comes with a TV and opens out to a private balcony overlooking the pool. Air conditioning, fan and safety box are available upon surcharge. Recently renovated, this room features a kitchenette, flat-screen TV and hairdryer. Air conditioning is available at extra charge. The extra beds are normal beds that convert into couches having back rests for the guests' comfort. 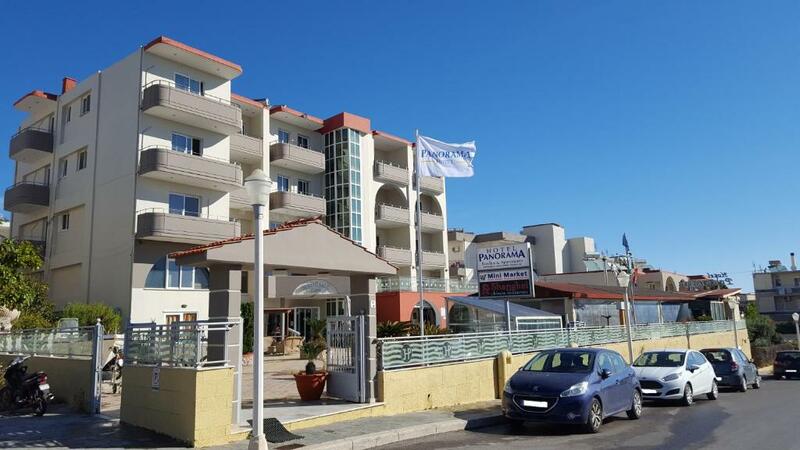 Panorama Hotel is located on the outskirts of Rhodes Town just 1.5 km from the centre and only 5 minutes from the bus station & taxi rank leading to almost any destination on the island. It is family run hotel boasting modern amenities and enjoying many features and facilities. Hotel provides a variety of excellent foods, exotic drinks, live entertainment and a well stocked mini market.. Panorama is close to Rhodes town, the old city, town beaches and the main bus stop easily accessible for guests who wish to visit the many attractions of the island. House Rules Panorama Hotel Apartments takes special requests – add in the next step! Panorama Hotel Apartments accepts these cards and reserves the right to temporarily hold an amount prior to arrival. Please note that no breakfast and dinner is served from November until March. Shower could be improved, the curtain isn't long enough to keep the water in the little tray so the water goes everywhere, and if you put the shower on full power it flies out of the holder. An older, seasoned and well organised property in a local neighbourhood ; on a hill with gorgeous views ! To the NE the changing colours & interesting 'moods' of the Aegean Sea and Turkish coast line with snow capped mountains beyond -quite lovely and a daily visual feast! To the East: spectacular sunrises most mornings of my extended Autumn-Winter stay. A great place to enjoy the large variety of bird life and butterflies around Rhodes town ;which is an unexpected, bonus surprise- especially from the top floors.The establishment and the surrounding area are serene, peaceful, low-key and safe. The sublime sounds of church bells drifting across the neighbourhood a few times during the week and of course on Sundays, complete this great choice of accommodation in Rhodes town. The apartment was adequate,clean, comfortable; and excellent value for money ; with joyously fast and reliable wifi. There is a big supermarket a few minutes away & a delightful organic farm produce shop around the corner. The taxis & buses is a convenient 3- min walk to the end of the street; with more shops & banks a little further on approx. 5-7 mins walking. Interspersed with modern island life are historical ruins dotted all around, in the vicinity of the hotel. The Acropolis is a pleasant and easy 15 mins walk from the hotel location. The staff and owners are discreet and welcoming. They first gave us a pretty dirty room and we asked them to change the room. They have changed it after I have showed them the dirty blanket. The next room we moved was dirty too! We had not have enough energy to continue to argue on after our bike tour on the island. I took photos of those problems.